From the highest levels of our Mid-Atlantic Leadership (and hopefully in conjunction with our National Leadership), we must repeatedly articulate authentic permission to be involved in pre-evangelistic/sowing activities. From speaking with our leadership, we believe staff do have this permission, but they aren’t experiencing it. Our rich heritage, the stories we tell, the metrics we count, and the experiences of Big Break and Summer Projects all speak more loudly than the permission that has been expressed. Our staff need to be persuaded that sowing activities will be regarded as meaningful and valid by their leadership. The remaining proposals, if enacted, should make plain to our staff that they do in fact have permission to spend their time on sowing activities. However, below are two additional thoughts on how our leadership can help the field believe that they do have that permission. Acknowledge at major events and in major communications that our traditional evangelistic methods are not sufficient to reach every student in the American campus culture. The evangelism day at CSU ‘09 was a perfect example of this. We believe it was courageous and incredibly helpful for our leadership to invite Tim Muehlhoff, Doug Pollock and others to address us in Moby. The content that was shared was unexpected and very encouraging. We applaud this and encourage more actions like it. Invest energy in communicating, even overcommunicating, why we must have an expansion of our evangelistic skills. Our leadership has communicated often and well about The Way Forward. The podcasts, face-to-face meetings, other communications (as well as the structural changes themselves), all communicated that our leadership expected new behavior from us. This communication strategy helped us understand that the changes were serious and we needed to pay attention. Similarly, through the letters and videos from Dr. Douglass and Mark Gauthier as well as other documents being shared with us, we are beginning to understand that we are moving to a flatter ministry structure with greater focus on the local level. Obviously, significant communication to the field is part of the overall strategy to enact these changes. We recommend a similar approach be taken regarding a change in our approach to evangelism. As the proposals are enacted, it’s important that our staff hear clear, repeated messages urging them to develop expertise in equipping students in natural evangelism. While we recognize that both our leadership and our staff can only tolerate so much change at once, we would respectfully suggest that developing this new evangelistic skills set is of such importance to the lost and to the future of Campus Crusade for Christ, that it warrants a major, national change effort complete with a comprehensive communication strategy. 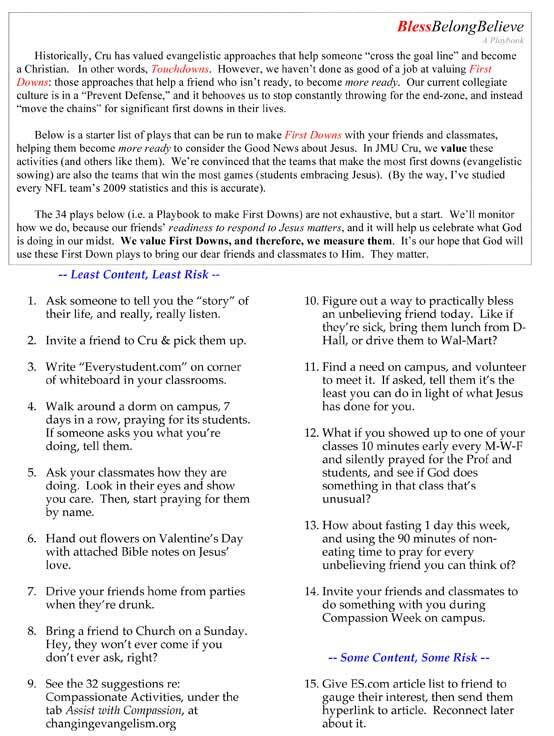 Here you can find a list of sowing ideas you could try on your campus.